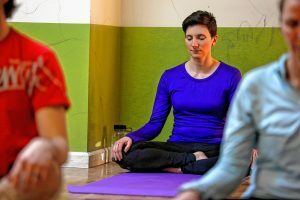 Sarah Keddell of Carver moves through a restorative sequence April 7, 2018 during Chronic Trips Inhale Exhale yoga at Ora Care in Springfield. The class combined cannabis and yoga. 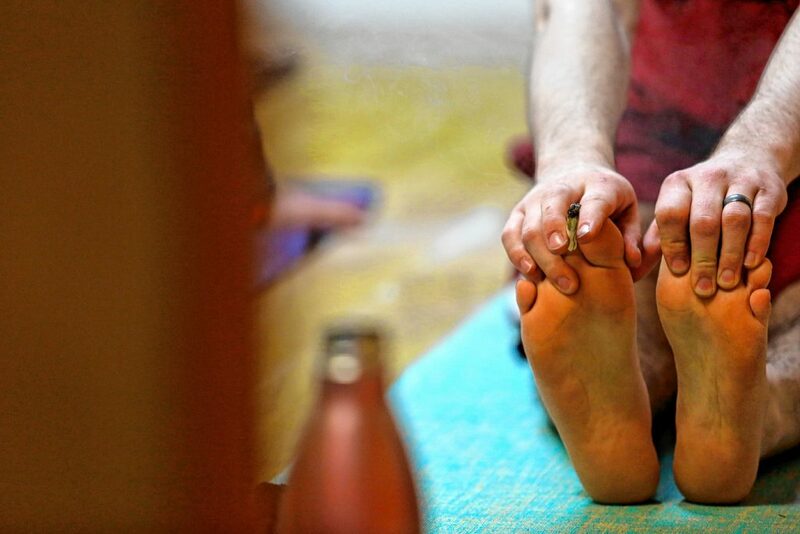 Slow, meditative breathing is an important part of most yoga classes, but at Chronic Trips’ first cannabis-friendly yoga class on April 7, there was also a different kind of inhaling going on. “We want to reduce the stigma of the lazy stoner,” said Chronic Trips owner Seth Frappier. Frappier hosted the first Inhale Exhale yoga at Ora Care in Springfield, a store and café that sells hemp and CBD (cannabidiol) products. Participants were welcome to bring their own cannabis or CBD products and consume them before and throughout the yoga practice. 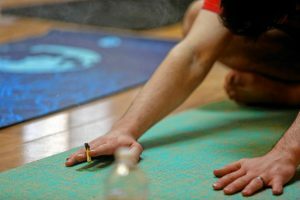 While some people in the room refrained from smoking, many passed around a joint as Frappier introduced himself and the yoga instructor, Jessica Young, from Easthampton. This yoga class was the first hosted by Chronic Trips and was a pretty unique event in the current cannabis climate. The Cannabis Control Commission in Massachusetts decided to push off regulating social consumption of cannabis until 2019, so in the meantime the only way to legally consume cannabis (alone or with other people) is to do so inside a private residence that is located on private property. 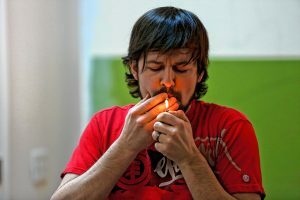 The stereotype of the lazy stoner is a persistent one in popular culture, but Frappier believes that cannabis can help many people to enjoy many physical activities even more than they usually do. Research published in Future Medicinal Chemistry, says cannabinoids can treat many chronic diseases that cause inflammation, including Crohn’s disease, rheumatoid arthritis, and multiple sclerosis. Yoga participant Sarah Keddell from Carver said that cannabis has helped her with insomnia and as an alternative to prescription anxiety medication. Frappier explained that both yoga and cannabis interact with the parasympathetic nervous system which is responsible for rest and digestion. Young made sure that the seven participants knew that they could continue to consume the cannabis they brought throughout the practice. Young said that cannabis helped her to deepen her yoga practice when she was learning to be an instructor. In addition to the physical benefits that Frappier mentioned as a benefit of cannabis, Young also believes that there are meditative benefit to cannabis that make it particularly well suited to yoga. “It helps you to drop into the moment more. It just relaxes the whole system and gives you the ability to be more single-minded,” Young said. Chronic Trips hosts other active events that are cannabis friendly, including nature walks, all year round. “It helps motivate and foster a holistic lifestyle,” Frappier said.